Let’s face it, one of the main purposes of Monsters in D&D is to serve as battle fodder for Adventurers. It’s time to explore the bottom section of the Monster stats, and talk Weapons and Combat. Warning: I have tried my best to make the contents of this series understandable without too much knowledge of the D&D 5e rules. This post goes into more arcane details than the previous ones, because the rules of combat are pretty intricate, and the details matter. I guess that is unavoidable: anything non trivial domain modeling effort will require diving into nitty-gritty details at some point. From a domain modeling standpoint, this part is a bit messy. We have a sub-section labeled “Actions”, but the items listed there are not actions - a Scimitar or a Shortbow are weapons. To make things even more confusing, right above, we have a section that isn’t even labeled, but contains actions - Nimble Escape allows the Goblin to take special Bonus Actions, Disengage or Hide. Let’s take a step back. In D&D 5e, when Combat occurs, specific rules apply. During each Round, creatures involved take their Turn, following Initiative Order. During their Turn, a creature can Move, take one “standard” Action (Hide, Dodge, Attack…), and potentially a Bonus Action. They can also take a Reaction out-of-turn, based on what other creatures do. As a possible Action, a creature can Attack another, using either the Weapons it has equipped, or some natural ability, for instance, Bite and Claw attacks for a Black Bear, which are represented in the same fashion as Weapons. Goblins typically carry a Scimitar and a Shortbow, which they can use to make an Attack as an Action. Today, we will focus on modeling Attacks with Weapons. Later on, we will look at turns, and ideally, explore whether we can use that to simulate battles, and maybe even identify winning fighting strategies for monsters with a sprinkle of machine learning. 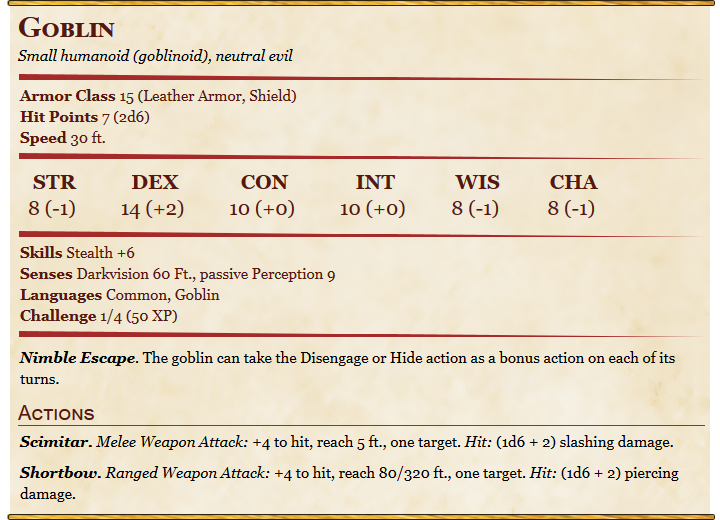 So let’s dig deeper into Attacks using Weapons, starting by an examination of the Goblin sheet. The Scimitar and Shortbow lines both display similar indications, +4 to hit, and Hit: (1d6 + 2). These are used to resolve the result of an Attack. An Attack starts with an Attack Roll: roll a d20, add a modifier (in this case, +4), and compare it to the AC of the target. 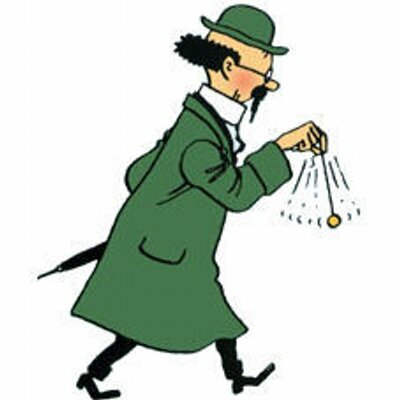 If the roll is greater or equal to the AC, it is a hit, which will cause damage determined by a 1d6 + 2 roll, to be deduced from the targets’ hit points. The two lines also have some differences. The Scimitar is marked as a Melee attack, that is, close-combat, while the Shortbow is a Ranged attack, that is, made at a distance. Both define a range (how far the attack can reach), but the Shortbow has 2 numbers, 80/320 ft., describing the short and long distances for a bow shot. Finally, each weapon deals a different type of damage, Slashing vs. Piercing. Where are all these bits of information coming from? Let’s assume the rules governing Monsters and Adventurers are mostly the same, and look into how an Attack gets resolved, in the simple cases. To determine if a Melee Attack hits, a d20 roll is rolled, and two modifiers applied: the STR modifier, and, if the Adventurer is Proficient with the Weapon (or type of weapon), the Adventurer Proficiency Bonus, which depends on their level. The damage dealt is resolved with a Damage Roll, determined by the Weapon itself, to which the STR modifier is added. In the case of a Ranged Attack, the rules are similar, but use DEX instead of STR. In other words, to determine the result of an attack, we need to know the attacker Abilities and their Level, whether a Melee or Ranged Weapon is being used, and what the Weapon Damage is. This is almost correct (or, as less charitable people might put it, it’s wrong). We get the expected results for the Shortbow (+4 to hit, hit: 1d6 + 2 damage), but the Scimitar is off. What are we missing? In addition to this, the PHB also breaks down weapons between Simple and Martial, which describes classes of weapons a creature is proficient with. While Weapon Properties appear in the PHB as a flat list, these are clearly not all on the same level. How should we organize this? One way to approach this is to consider which ones are incompatible with each other - they probably belong to a Discriminated Union - and which are not - they might fit in a Record. So how can we go about a data model for Monsters and Weapons, to determine the resolution of an attack? The first issue we’ll need to address is that the signature for our earlier attackModifiers function won’t work, because different attacks are possible with a single Weapon. First, a Weapon that has the Thrown property can be used both for Melee and Ranged attacks. Then, for a Melee Weapon, there are options, too - some are Versatile, allowing to make attacks with one or two hands, and Light Weapons can be used for Two-Weapon Fighting, using a second weapon Off-Hand. This is complicated. First things first, a signature along the lines of what we had previously, Monster -> Weapon -> AttackResult won’t do. We could specify what type of attack we are attempting, but we would need to handle the fact that the attack could be impossible. In that frame, we could try something like Monster -> Weapon -> AttackType -> AttackResult option. The angle we will take instead is to generate all the attacks that could be made, that is, someting like Monster -> Weapon -> AttackResult list. One benefit of that approach is that we can now separately generate the list of melee and ranged attacks, each in their own function, and merge them together into a list of all possible attacks. Let’s start with Ranged attacks, because they are a bit simpler. We compute the ability modifier, based on DEX for a ranged attack, determine whether the proficienty bonus applies, and whether the attack is one- or two-handed. If the Weapon can be used for a ranged attack, we create a list, with a single item describing the attack made, and otherwise we return an empty list. Are we done with ranged attacks? Well, not quite - we are missing two cases. First, some weapons, such as a Spear or a Javelin, have the Thrown property, which means that they can be used both for Melee and Ranged attacks. We will handle this by introducing a third case to Usage, Thrown, which will combine in a tuple both RangeInfo and MeleeInfo. This also has implications on the ability bonus: instead of DEX, the hit bonus for a Thrown Weapon uses STR. The main change here is that instead of using DEX by default, based on the weapon, we extract a list of the abilities we could use, DEX and/or STR, and select the one that gives us the best damage. Now that we have the ranged attacks covered, let’s dig into melee attacks, and how they are different. Two quick comments here. First, while that term doesn’t exist in the rules, we included a Normal Handling category besides Light and Heavy. A discriminated union is collectively exhaustive and mutually exhaustive: no matter what the situation, we should be in one and only one of the cases. As it turns out, some weapons are neither light nor heavy, and we need to describe them, too. It’s not uncommon for people to describe only how an item is unusual, without naming the “normal” case - watch out for this! The other point perhaps worth noting is how we separated Weapon.Grip from AttackGrip. On the surface, they might appear as one thing (can a weapon be used with one or two hands), but they appear in slighty different contexts, and forcing them into a single representation would force us to handle cases that should not even be possible. Side note: if you are wondering how to handle creatures that have more than 2 hands, per this RPG StackExchange discussion, a creature could wield multiple weapons, but is limited to attacking with at most 2 light weapons. That’s one complication avoided! This is where returning a list of attacks will start paying off, because the same exact weapon could be used to perform 2 different melee attacks - or even 3 in theory, for a Light Versatile weapon. This is almost right. We get the same results as the Monster Manual, except for the Goblin Boss Hit Bonus, which we over-estimate by 1 point in every single case. I think the source of the issue is probably the proficiency bonus; I assumed that the number of Hit Dice for a monster played the same role as the Level for an adventurer. This seems to work out in many cases, but I observed the same discrepancy for the Hobgoblin Captain, which also has 6 Hit Dice. I will leave the issue open for now - I still hope somehow that Hit Dice can be mapped to a proficiency bonus, just following a different scale from the one linking level to proficiency for adventurers. I will stop here for today - you can find the code in current state here. We are not done with weapons and attacks, but this was a bit of a dense post, and I need to do some thinking on where to move from here. Besides the issue mentioned above, there are a few challenges ahead. First, some monsters use “natural” attacks, such as Claws or Bite. This is similar to the natural armor issue we discussed in the previous post. While some creatures can choose which weapon to use, some others can’t - it would make no sense for a bear to drop their claws, and pick up a sword to fight. In other words, some creatures have the ability to carry and use equipment, and some do not. I am not sure how to represent this just yet. Then, there are some gaps in our model. As an example, some magical weapons deal more than one type of damage, or deal additional damage to specific creatures. This suggests that a richer model for weapon damage is needed, perhaps with a list of conditions and the corresponding damage. Finally, we ignored one aspect of the rules here. A Small creature using a Heavy weapon will make an attack roll at a Disadvantage. Advantage and Disadvantage should probably be incorporated in the model for dice rolls we fleshed out in our 3rd post. However, I didn’t feel ready to do so just yet. Given how pervasive dice rolls are in the game, before committing to any design change, I would like to explore more of the domain first, to get a better sense for how this might impact different areas. In other words, we are far from done! As an intermediate goal, I hope to arrive to a representation of monsters that is good enough for me to simulate battles between various groups of adventurers and monsters, and evaluate how balanced different encounters are. So… stay tuned, more posts will be coming on the topic!